I have never had a FoodSaver bag split and have used rolls and rolls of them over the years for sous-vide. Does the recipe actually call for boiling water? In boiling water, any trapped air is going to be expanding a lot. I would also think that you would get ballooning due to the expansion of steam that is created by the vaporization of the moisture in the bag. Is it possible that the recipe is missing a step of turning the heat down so that the water is simmering rather than boiling? I noted that while low end vacuums are fine for meat and fish, with some fruits and vegetables my bags started floating. If you take actually a cucumber or an apple and stick it into strong chamber vac with fluid it will start boiling, works with a syringe and your thumb too. Not sure if a home vac produces this kind of vacuum. If the bag split, it probably simply got too hot. I would think lower temperature and longer time should be OK. Not all vacuums bags are mend to be heated not even talking of cooking them. Vacuum bags usually are made of PE (polyethylene) or a combination of PE and PA (polyamide). See http://en.wikipedia.org/wiki/Low_density_polyethylene : LDPE ... can withstand temperatures of 80 °C continuously and 95 °C for a short time. 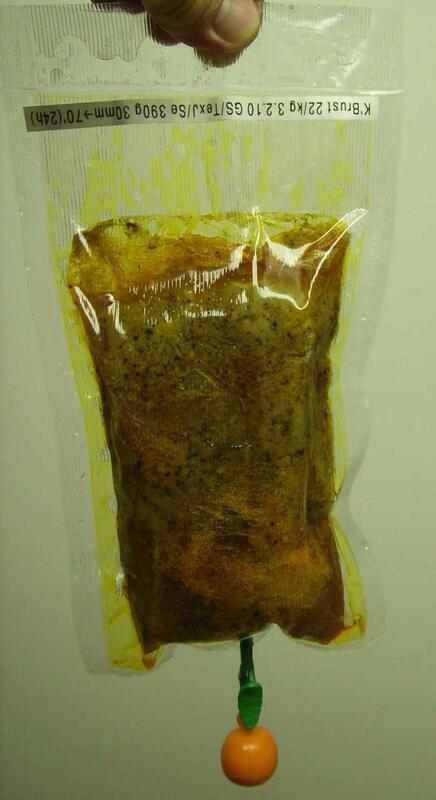 So I should expect vacuum bags to withstand temperatures usual in sous vide cooking, i.e. 43°C (fish) up to 80°C (vegetables), and in my experience they actually do withstand 78°C, but they are not made for boiling. At boiling temperature, water (contained in food) becomes steam, so any sealed bag (irrespective of the vacuum level) will balloon and float and eventually get ruptured. 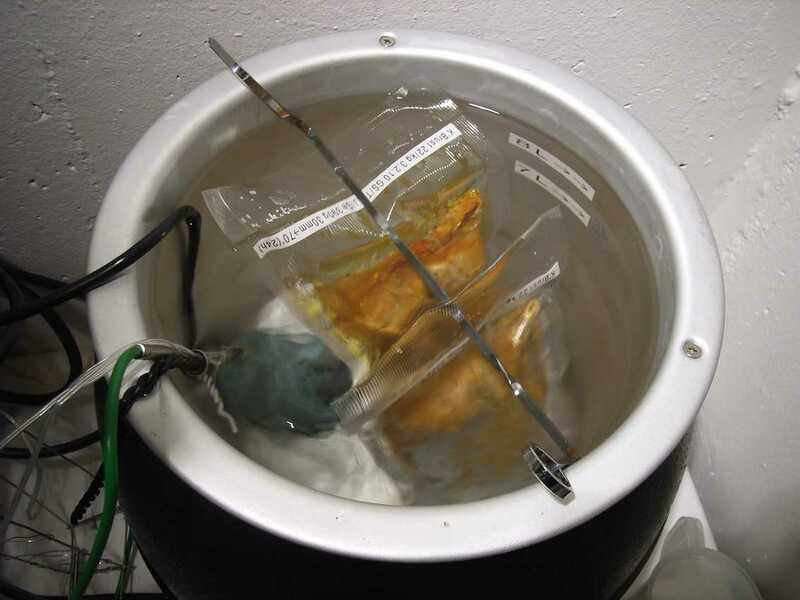 Some vegetables and fruits contain air (that's why you can vacuum-infuse them with liquids, see http://sousvide.wikia.com/wiki/Instant_rum_pot , this works even with clamp-type machines to some extent), and at higher temperatures this air will expand and make the bag float. So for cooking vegetables sous vide, a rack might be appropriate to hold the bag in position. 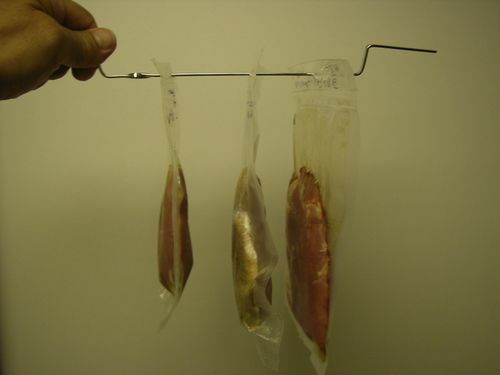 I always suspend my bags on a skewer which keeps them in a vertical position and apart from each other, whereas just dropped in the water, they tend to lay horizontal and float. I notice that he wasn't using FoodSaver bags but "foodsaver-type" bags. So, I can't say anything about what temperatures and conditions those particular bags were meant for. Foodsaver bags were designed to be cooked in -- and are even dishwasher safe (i.e. they don't melt in the dishwasher) -- unlike Ziploc. The temperature by itself was probably not the issue. They are not, however, designed to withstand the internal pressures of hot expanding gases. And, there is the possibility that there was a bad batch of bags. That is incorrect. Their website (faq) says explicit that no raw foods should be cooked in these bags. They also say that certain vegetables will give of gases like cauliflower ..... so this is probably what happened with the bag. Some of their bags say though they are safe for simmering but cooking in it for 40 minutes is probably pushing it. I believe that you are mis-reading both the FoodSaver FAQ and my message. Nowhere on the site does it say that the bags were not made for cooking. They explicitly have directions on cooking sous-vide. If I am not mistaken, sous-vide cooking is cooking. I have not said that the bags are designed for boiling food. What they are NOT designed for is being left sealed in boiling or vigorously simmering water or left sealed in a microwave (where if you aren't careful you are going to create a lot of steam and explode the bag. Maybe I wasn't clear enough in how I expressed myself. I thought I was pretty clear in being dubious about whether they were meant to withstand the internal pressure of steam. The FoodSaver FAQ item that I believe you are referring to is about microwaving food. So, their remark about raw food should be taken in that context. I believe they are simply saying not to MICROWAVE raw food. It does not mean not to cook raw food in a foodsaver bag (which obviously would be at odds with the link I provided above about cooking sous-vide). They are probably being cautious vis-a-vis microwave ovens because it is so easy to accidentally overheat the bag causing a lovely steam explosion. There is a warning on the FoodSaver site about not putting the bags in simmering water. My suspicion is that this is because "simmering" as practiced by most home cooks can be anything from a gentle simmer to actually boiling and they want to limit the occurrence of exploding bags due to people putting them in water that is approaching boiling. As I said, I suspect that the recipe is missing a step -- I believe that the water is probably supposed to be turned down to a gentle simmer after putting the bag in the water. I doubt if any sealed bags are really meant to contain steam for extended periods of time -- which is that you will get if you put a bag in truly boiling water or heavily simmering water. Some googling taught me that vacuum bags by FLAEM NUOVA (MagicVac), FoodSaver and LAVA are made of an inner layer of PE (polyethylene) and an outer layer of PA (Polyamid/Nylon), and that they are safe for freezing, boiling and microwaving (provided you puncture the bag before microwaving). LAVA and MagicVac say their bags can be used with other brand vacuum machines, FoodSaver say no. Hi Guys, What do you think is the best temp/time for a beef brisket? I tried the temp from cooking issues' primer 62°C for 48H but it came out hard and the connective tissue was still there holding the meat fiber. It was horrible. Many of us prefer brisket 48h/55°C, this is the lowest temperature that can be recommended from a safety point of view, and it comes out nicely pink and succulent. See http://sousvide.wikia.com/wiki/Marinated_Brisket and . At temperatures over 59-60°C collagenase gets inactivated, so you miss the enzymatic splitting of collagen and fully depend on heat induced breakdown of collagen into gelatin which is faster the higher the temperature. If a "brisket" does not come out fork-tender after 48h/55°C, they may have sold you meat from a different part of the animal which contains more elastin than collagen, and elastin will never dissolve. Thanks for the answer, Check out the picture of the horrible cooked meat on my blog: www.fiftyfourdegrees.com It's the latest post. The connective tissue were like rubber, the meat itself was reasonably tender, but it was stuck between these honeycomb-shaped pockets of rubbery collagen. it was completely inedible. the problem really seems to be in the connective tissue and not in the muscle fibers, which might confirm my suspicion that it was a piece of meat with too much elastin; I had such an experience as an Xmas flop! The meat was spent some time in a brine, could this have caused the horrendous texture? I have no experience with brining, maybe Douglas Baldwin can enlighten you. The picture that you posted looks like either a poor quality brisket or not a brisket. Enter 'brisket' in the search this topic box that appears towards the bottom of the window and you will find a lot of good information about brisket -- as well as some pictures of what a decent brisket should look like. Was that a heavily brined piece of meat? Not that that should make a difference as corned beef is heavily brined brisket and I have done sous-vide corned beef at 133F for 48 hours and it was very tender. At a higher temp, I would have expected it to be no less tender. Maybe it was a poorly trimmed brisket. Not sure. But do look at the pictures of sous-vide brisket found in this forum. Somewhere while surfing I came across a post from a chef who was describing a solution that was painted on the surface of a meat that would make the crust better when searing. My recollection is that the individual used a mixture of honey and baking soda (and maybe something else) that would quickly carmelize during the sear. Does anyone know this formula, or have other ways of surface treating the meat surface (other than drying) to promote a better crust? Ok, so right now I've got beautiful short ribs sous-viding for the next 72 hours. All the short rib recipes I'm familiar with use their braising liquid as a sauce, naturally. Since I get to take advantage of the meat being served medium rare, do you guys have any suggestions on how to finish it off? I was just thinking of making a wine/veal stock reduction, but I'm sure there is something more interesting that can be done. and http://amath.colorado.edu/~baldwind/sous-vide.html chapter "Maillard reaction". When browning meat cooked sous vide, we want brown the surface without overcooking any of the interior. Since time (primarily) determines how much of the interior is overcooked, we must brown the surface as fast as possible. For the fastest possible browning, we need amino acids available to react, we need reducing sugars available to react, and we need heat to get the reactions going. Martin (over at Khymos) showed how well baking soda improved the browning of onions by making the amino acids more available to react. In meat, we are more concerned with the availability of reducing sugars, so washing the meat with a reducing sugar (such as glucose or fructose or lactose) should speed up the reaction considerably --- this availability means we can brown as quickly in a (smoking) hot skillet as we can with a blowtorch. BTW browning meat is the "Maillard reaction"; caramelization concerns sugars only, not amino acids. If the short ribs are good quality, I like to treat them like prime rib. I personally like something simple like sour cream with some horseradish in it. Or a simple shallot/butter/wine reduction with some filtered jus. (Oh and I either blast them with a torch to brown or sear them in a smoking hot pan). This is my first post on the eG Forums! I would like to thank everyone on this thread for providing me so much inspiration! It has taken me a few weeks, but I have read through the entire 110 pages! I've been so inspired that I purchased a laboratory waterbath (unstirred) which has a 7-9 litre capacity (ok for most usage), but unfortunately only goes up to 80C. My first experiment was with chicken breasts wrapped in smoked pancetta with some butter and smoked salt and pepper. Also tried chicken breast with some duck fat and lemon juice and a slice of lemon for experimentation . I put them in at 60C for about 2 hours. Some of the best chicken I have ever tasted! Wonderful soft texture, and really juicy and full of flavour. Actually both were really popular with my housemates. I served them with a sauce recipe I found in this thread which was made from sauteed mushrooms and cream. I then skinned and brined two duck breasts with salt, sugar, star anise, cinnamon, camomile tea, lapsang souchong tea, bay leaf, clove, 1 garlic clove, juniper berries, black peppercorns, for 12 hours. Then bagged with some duck fat and salt and pepper at 55C for about 5 hours (will try lower and longer next time as a comparison next time:) ) I then seared afterwards and served with crispy duck skin that I cooked in the oven separately, and a reduction of apple juice, orange juice, chicken stock, vintage port, stoned cherries, and blueberries. Also with some smoked garlic confit, sauteed spinach, and some glazed carrots and asparagus. I made salmon mi-cuit. Cooked in vanilla oil with some more seasoning for 15min at 45C. It was really nice, but next time I will try 40C for about 40mins as I have seen that temperature/time combination elsewhere. A few days ago I cooked a rolled prime rib of beef for 24 hours at 55C. Seared with a blow torch first. Then cut down the middle and then the two steaks were seared in a hot griddle afterwards. This was inspired by Heston Blumenthal's perfect steak. I chose to do it at 55C after reading so much about potential bacteria growth etc. The meat was a perfect medium-rare. However next time, I will do it at the same temperature as Heston which is 50C. The flavour and texture was really nice. I finished it off with some melted smoked butter, and sprinkle of smoked salt. As I said before, my waterbath only goes up to 80C. So I'm trying to confit some duck legs as we speak at 80C... I guess at this temperature I will probably let them go for 12 hours. Any comments? I've seen Nathan said that he does his at around 82C for 8-12hours, I'm guessing 2C wont make too much difference, so I will just up the time to the upper boundary of his suggestion. Comment by PedroG: 24h / 50°C is definitely dangerous. You might try 53°C if you can keep your bath stable at 53°C ± 0.1°C controlled by a NIST- or ISO-calibrated high precision thermometer. With an unstirred bath and without a calibrated reference thermometer you should rather stay at 55°C. Perhaps I am over-cautious but I would be wary. Blumenthal's method relies on your having killed off all exterior pathogens in an initial pre-cook torching AND on the interior being intact muscle meat. The inside of a rolled roast is not intact interior muscle meat and I would be concerned that it would be in the danger zone far too long to be safe. I wonder how safe Blumenthal's method is for sous-vide where the meat would basically be incubating for 24 hours. If you fail in the pre-cook sear to kill all the pathogens, then the meat will be bathing in them (unlike when cooking in an oven in air where any failure will remain isolated. Thank you for your advice and suggestions. 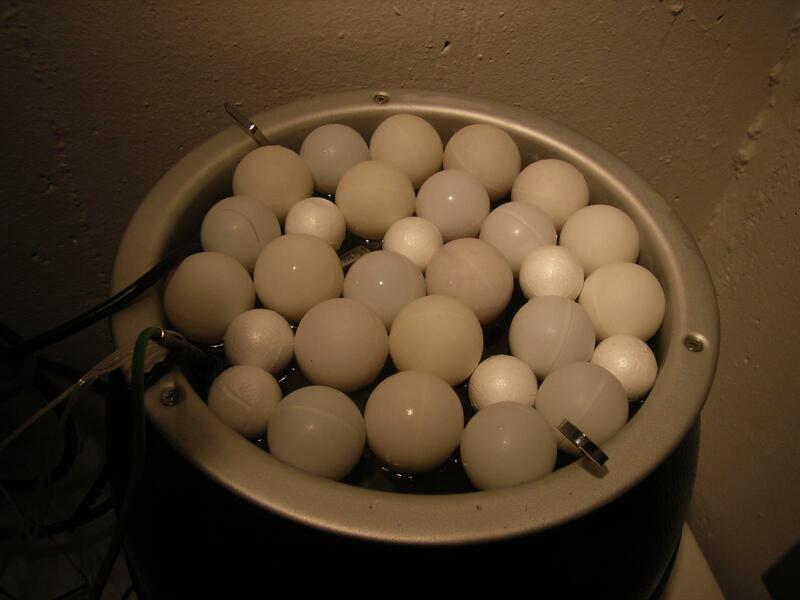 The bath is unstirred but has heating elements on three sides and the bottom, and is double insulated (two layers . It also has a lid (which I didnt photograph) which fits nicely on top and prevents much of the temperature fluctuation. The bath is pretty good at holding a steady temperature (albeit according to its thermometer in unstirred water, but apparently the design of the heaters is such that it promotes convection currents). To quote it's manual "The Tank of the bath is made of seamless corrosion resistant stainless steel for a longer life time and easy cleaning. By means of the smooth surfaces of the tank, the risk of contamination is minimised. The sheet heaters are placed on 3 sides outside of the tank, the use of a PID control system and triple insulation consisting of glasswool, an aluminum layer layer and an air gap, gives this water bath an excellent temperature uniformity and stability." ALTHOUGH IT ONLY ALLOWS ME TO COOK UP TO 80C! I agree with the floating issue, however that photo was of the beef, which wasnt actually floating, its just horizontal coz thats the only way it would fit in. The bath is more shallow than I would like. As I am currently using ziploc bags, i do try immersing them in cold water first to help get rid of the air inside and then sealing, but there is still always some. I have tried a skewer through the top above the seal to keep them vertical, which does help. I was quite annoyed that there was a really cheap chamber vacuum machine for sale on ebay today, but I missed it due to my gf hassling me!!! So I have been considering getting this Food Saver. What are your thoughts please? Once again I really appreciate your feedback! Hey e_monster, thanks for your reply! Having read 110 pages of this thread, I have already realised what a friendly and helpful person you are! I guess you are right about the intact muscle thing... to be honest a rolled rib roast is quite a pain in the **** to sous vide since it doesnt really hold its shape well, so I had to wrap it in cling film first. Then after, it will still kinda unravel, which isn't particularly attractive. I would like to try a fore rib of beef, on the bone, as Heston does. I really think the texture would be so much better at 50C. I really wanted to try sous vide at this temperature for maximum flavour and juiciness, but if indeed 50C is not safe in sous vide, is it actually safer in an oven? If so, how about putting the beef in one of those roasting bags, to help prevent it from drying out? I can't see exactly what you are trying to achieve. It is easily possible to keep well within the food safety guidelines AND have excellent Sous Vide results. The rough rule of thumb I use is for tender meats cook at the temp which gives you the level of doneness you like. For me this is 53C (127F) which gives rare-to-medium-rare on my scale. For any SV cookery times should be kept to below 4 hours where temps are below 54.5C (130F). This is not a problem as already tender steak is fantastic with only an hour or 2 at the doneness temp you select. For tough meats on the other hand - pick any temperature you like and so long as it is 54.5C (130F) or over cook for as long as you like. I really like the meat on beef short ribs and generally cook them at 56C (133F) for 48 hours. The meat is still pink, juicy and flavourful - but most of all tender and succulent like rib-eye. Heston Blumenthal's "perfect steak" recipe (which I have wanted to do) is a non-sous-vide technique where you torch the a prime rib briefly (just enough to sterilize it AND start a little browning) then cook it for 22 hours in an oven at a very low temp so that the inner temp only gets to 122F. The reason for doing this is -- as I understand it -- that there are particular enzymes that breakdown the meat in a very particular way and that these enzymes are denatured at temps around 120F. Since Blumenthal knows his stuff and swears by this method, I would have to guess that the result are scrumptious. Here, the slow cooking isn't to render tough meat tender but to get a particular kind of tenderness and maximum juiciness. I contemplated doing a sous-vide approximation until I read an interview with Harold McGee where he mentioned that he was blown away by how the browning that started with minimal torching developed even when cooking was done well below temps at which you would expect any such development to occur. I have read quite a few blogs where people executed the recipe and universally people rave about it -- and since they all rave about how juicy the result is -- I don't think you need to put the meat in a roasting bag. That might even have a negative impact on the texture of the outer layer. A little bit of surface evaporation is going to help the crust development and browning in the final stage. In the same way that beef benefits from a bit of dry aging. The thing is, I'm quite sure that in the recipe he slices off the browned outer layer after the 24 hours in the oven. He then portions them into steaks, and pan fries them (for quite a long time according to his tv show In Search of Perfection - 2 mins each side I seem to recall), which would develop the crust. Also that I read somewhere in the thread that actually above 47 or 49C all bacteria apart from one strand will be destroyed, and only that strand has only been seen to survive in a laboratory due to the "Phoenix Phenomenom". I think that is what Douglas Baldwin mentioned. Therefore I would have thought that if you can accurately get 50C, or maybe 51-52C for a margin of error, then you would be ok. When I was in the supermarket the other day I also bought a whole guinea fowl, and some quite small joints of smoked gammon. Could anyone recommend some lovely recipes for either of these, and whether the gammon should be brined first, or that would ruin its smoked flavour? Also, as vacuum sealer recommendations go, how is the Foodsaver V2860?